Paradise Hideaway is a gorgeous 2-bedroom, 2-bath house with a large pool that is perfect vacation home for a family or group of friends. 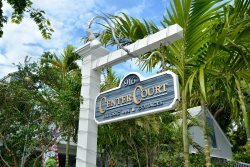 It's located in the heart of Old Town Key West, within walking distance of an eclectic mix of restaurants, bars, art galleries, attractions and shopping. The house also is a wonderful place to relax, with an outdoor dining area, outdoor sitting area, lounge chairs and a BBQ gas grill. The bar area indoors has a flat screen TV, ideal for watching games or favorite shows. All linens and beach towels provided. Parking: Two off-street spots reserved, on-street parking also available. Pets: Pets are welcome, although some size restrictions apply. There is a $200/month pet charge. Location: 5 blocks to Duval Street in Old Town Key West.